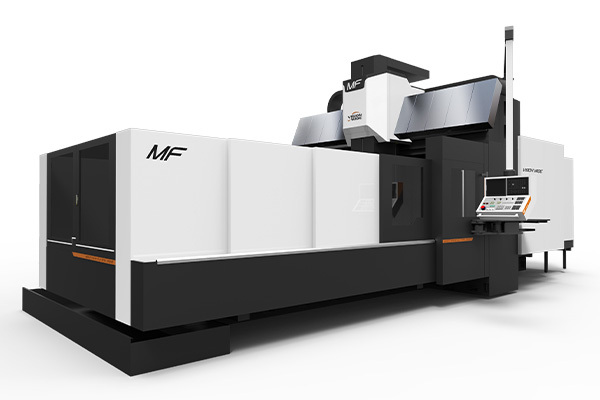 MF series bridge type machines, with typical VW products features of rigid structure and high precision, are designed with box ways with hand scrapping, slant beam with three ways, direct-driven Y-Z transmission, to get the heavy cutting and precision cutting with high acceleration/deceleration control. It's the best choice for medium-to-large parts and mold machining. Z-axis is at the symmetrical position of spindle motor, offering accuracy and precision with micro smooth movement. Using Japan made JIS0 gears for gear head to get the advantages of high rigidity, high precision, and low noise. 1. 3 axes independent ball-screw cooling device. 2. Solid casting structure, providing good mechanical static and dynamic accuracy. 65 degree slant beam device, with 3-sliding ways, provides the strong supporting to headstock. It offers the best performance for heavy cutting compared others with the same column distance. Direct-driven device on Y-Z axis transmission, with big servo motors, ensures the best accuracy and acceleration.